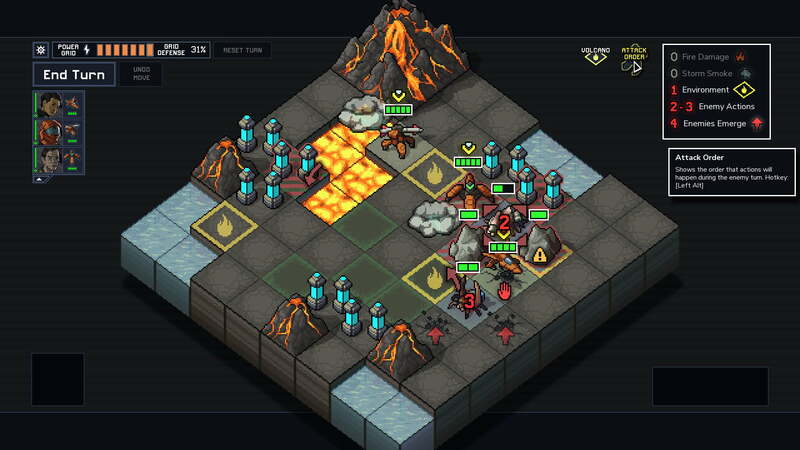 Subset Games manages to better FTL with an impressive tactics game. Giant mecha shows like Mighty Morphin' Power Rangers and Mazinger have a way of bringing out our in-born destructive streak. It's weirdly cathartic to see a giant robot crashing through a city like a child would through a Lego set. It's a theme that appears again and again in our shows, our movies, and our video games. And yet it's a theme that's been strangely absent in our mech games over the years. In Super Robot Wars, for example, the focus has long been on the mechs doing cool things, with the city mainly offering terrain penalties and little else. Into the Breach is one of the few mech strategy games I can think of where the buildings almost matter more than the units themselves. 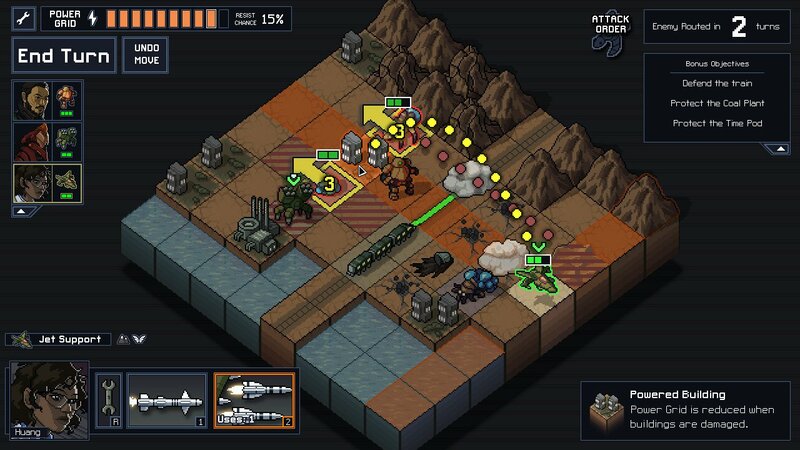 Developed by the same team responsible for the superlative FTL, Into the Breach brilliantly melds its concepts with what you might call a smaller scale Front Mission—the classic Square strategy sim in which you manage a fleet of giant robots and their pilots. It features a squad of time-traveling mechs locked in an eternal struggle with the Vek—monsters that emerge from beneath the earth to menace the human cities above. As the Vek destroy the human buildings, a power gauge that carries over from mission to mission steadily declines. If it reaches zero, you have to loop back to the beginning of the timeline to try again. Into the Breach pits time traveling mechs against massive bug monsters. 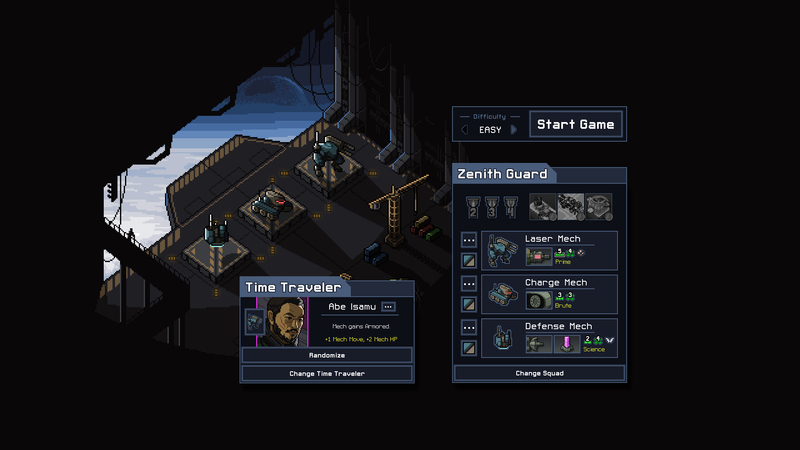 Like FTL, Into the Breach includes permadeath for your pilots, light RPG elements, and randomized upgrades. You can't save and reload, so if you make a bad mistake, there's no going back unless you restart the timeline entirely. Ultimately, your goal is to power up your mechs to the extent that they can take on the Vek directly, upon which they must survive a difficult multi-stage battle through each layer of the earth. All of this is great, but where it really shines in the way that it makes you consider your environment. When you punch a Vek, for example, they will slide over a square. If a building is in the way, the Vek will take extra damage, but the building will also crumble. It's a moment that neatly captures the excitement of watching the Megazord punch a monster right into one of Angel Grove's many random skyscrapers. As Into the Breach progresses, you quickly learn to take advantage of your environment. Vek take a turn to emerge from the ground; so if you punch a monster over to the area where they will pop out, they'll both prevent an enemy from appearing and take some extra damage themselves. If they're near a body of water, you can punch them into the ocean for an insta-kill. With only three mechs at your disposal, these tactics are crucial against more powerful foes. But the environment can hurt you, too. Artillery blasts will set patches of grass aflame; volcanic eruptions will send fiery rocks hurtling at your units, and seismic activity will cause whole areas of the map to drop away. You will have to become proficient at rapidly adapting to a changing situation and keeping your mechs out of harm's way as the ground shifts beneath your feet. Into the Breach forces you to constantly adapt your strategy on the fly to changing environmental circumstances. All of these elements come together for some fascinating strategy, which is further amplified by the need to keep humanity's cities safe. Losing one building isn't catastrophic; but as the campaign progresses, losses will quickly mount until you run out of room for error. Further complicating matters is the fact that your own fire is just as capable of wreaking havoc as that of the Vek. Indeed, one of the most important upgrades you can get for your initial artillery piece is the ability to avoid harming your own buildings, making it much easier to fire directly on top of it and push away the encroaching Vek. Often the best solution is to simply nudge a Vek into another square so that they hit a mountain—or another Vek—instead of a valuable building. The main benefit of this approach is that it keeps the focus relentlessly on the strategy. One thing that has always bugged me about Advance Wars and Valkyria Chronicles is the way that maps have a tendency to feel like puzzles. This issue is especially acute in Advance Wars Dual Strike, where it's very easy to fall into an unwinnable stalemate unless you follow a prescribed set of steps to win. Into the Breach neatly avoids this pitfall, as well as several others. Its small maps keeps the action focused and the missions short. Mechs are upgradeable, but not to such an extent that they become unstoppable killbots. Indeed, even if you have a fully upgraded fleet, it's still very possible to lose too many buildings and fail anyway. Into the Breach manages to avoid many of the pitfalls of similar games like Advance Wars. Into the Breach also learns a few lessons from FTL. If you fail, you get to bring an upgraded pilot of your choosing back in time with you, mitigating some of the frustration of losing out on an especially productive run. The difficulty of the endings also scales to the power of your mechs, making it less imperative that you grind encounters while praying for the right item drops. It's a brilliant strategy game, one that reminds me of an observation that I heard about game design recently, which is that complex systems are formed by bringing a lot of smaller systems together into a greater whole. No game better exemplifies that philosophy than Into the Breach, where every element fits together seamlessly to form one of the most enjoyable strategy games I've played in a long time. It's tough to top FTL, but I think that Into the Breach might have done it. Play it immediately—it's destined to be remembered as one of the best games of 2018. Tagged with Analyses,	ftl,	Indie,	PC,	Strategy. STREAM | We play the indie darling from the creators of FTL at 2pm ET/11am PT.